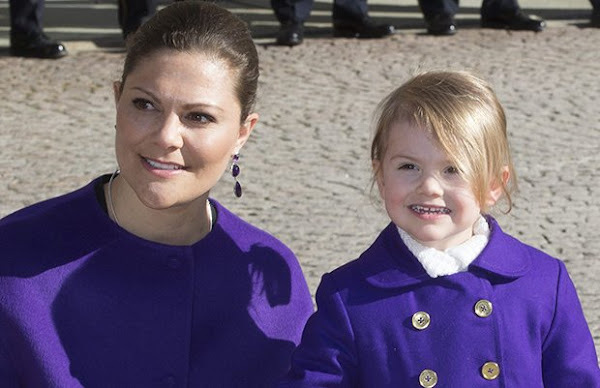 Crown Princess Victoria of Sweden waits for giving birth to her second child in the next weeks and for that reason, Crown Princess Victoria's Name Day which is celebrated annually on March 12 will not be celebrated this year. Princess Estelle's hair is naturally coloured or it is synthetic?? It is natural, we do not dye hairs of two year old´s here in Scandinavia. What a strange thought. She is too young to have her hair dyed. Her father was blonde when young and she's got some strong blonde genes on her maternal grandfather's side so it's not a surprise that she's got her hair like that. But I believe that she will turn a brunette later. Thaat was not a very intelligent question. Blondiini is correct. Who in the world colors the hair os small children. Is this a serious question? Of course it is natural coloured! That reminds me of a woman in my old European country. Her granddaughter was a regular Shirley Temple, beautiful curls & ringlets. Gran always denied curling it, but curling it she did. And another person, a tenant in our house, she burned her poor little girl's head to with chemicals make her white blond. I have never forgotten the name of the little girl, Lidvine. That was in the 40's. To dye small children´s hair at age two would be here a very very quick way to get child welfare there and child to custody. Denke, dass die Frage ernst gemeint ist. Rajashree ist wohl aus Indien. Vielleicht färben sie dort die Haare der Kinder bereits in diesem Alter. Wer weiß? ...mich wundert gar nix mehr??!?!??! And Scandinavian hair type mostly gets darker with age. Estelle can have her mother´s hair color when adult.